Third revised edition, loaded january 19, 2016. "Oh most fortunate one of those who are respected to speak, please tell us about the message of the Bhâgavatam the way it was discussed by S'ukadeva Gosvâmî. When, where, on what ground and wherefrom inspired could this literature be compiled by sage Vyâsadeva? His son, who, being equipoised and unwavering, always had his mind fixed on the One, was a great devotee and an awakened soul, but unexposed he appeared to be ignorant. Naked bathing beauties covered their bodies out of shyness when they once saw sage Vyâsa in clothes following his son, whereas they astonishingly, by him being asked about his son, replied that [they did not feel ashamed before him because] he looked at them purely without any sexual discrimination. How was he [S'uka], appearing like a retarded dumb madman as he wandered through the Kuru-jângala provinces, recognized by the inhabitants of Hastinâpura [now: Delhi] the moment he reached the city? How could the discussion covering this Vedic truth [about Krishna], oh dear soul, take place between the saint and the descendant of Pându, the wise king? He, as a pilgrim sanctifying the places he visits, stayed at the door of the householders only for the time it takes to milk a cow. Please tell us about Parîkchit, the son of Abhimanyu, who is said to be a first-class devotee whose birth and activities are all wonderful. For what reason did the emperor, who was an honor to the name of Pându, neglect the opulences of his kingdom and sat down at the Ganges to do penance until his death? Oh why did he, at whose feet all enemies surrendered their wealth for their own sake, in the prime of his life give up his so difficult to relinquish life of royal riches? Men devoted to the One Hailed in the Verses, live for the welfare, the affluence and prosperity of all living beings and not for any selfish purpose; for what reason relinquished he, freed from all attachment, his mortal body that was the shelter for others? Explain to us clearly all that we asked you about this subject, for we consider you fully acquainted with all the meanings of the words in the scriptures, except for those of the Vedic hymns." Sûta Gosvâmî said: "When Dvâpara-yuga had entered its third [last] phase [*] and the age expired, the sage [Vyâsa], a partial expansion of the Lord, was begotten by Parâs'ara in the womb of the daughter of Vasu [Satyavatî]. One morning when the sun globe rose above the horizon he, after being cleansed by the water of his morning duties, sat down at the bank of the river Sarasvatî to focus his mind. The rishi knowing the past and the future, saw that gradually irregularities were developing in the dharma of his time. It was something that can be observed more often in the different eras on earth as a consequence of unseen, irresistible forces. The sage with his infallible eye of knowledge noticed that the common man was unlucky and short-lived and that, with the dullness and impatience of faithless people lacking in goodness, the natural capacity - the talent - of all types of men as also of other creatures was declining. Therefore the muni with his transcendental vision contemplated on what would benefit the welfare of all vocations and stages in life. According to the insight that there were four sacrificial fires for purifying the work effort of the people, he divided the one original Veda into four divisions for the sake of the continuation of the sacrificial activities. 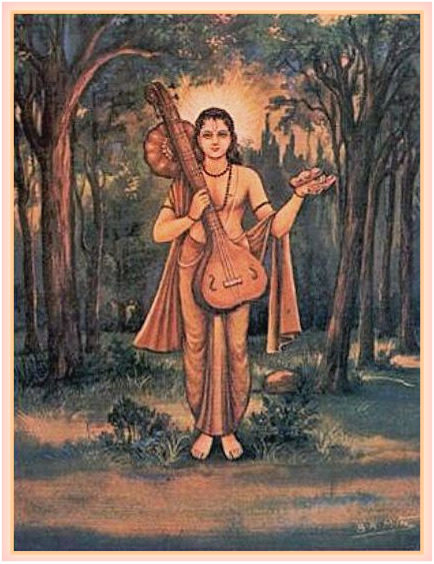 Rig, Yajuh, Sâma and Atharva were the names of the four separate Vedas while the Itihâsas [the single histories] and the Purânas [the collections of histories] were called the fifth Veda. The Rig Veda thereupon was propagated by the rishi Paila, the Sâma Veda by the learned Jaimini, while Vais'ampâyana was the only one versed enough to qualify for the defense of the Yajur Veda. Angirâ - also called Sumantu Muni - in his formidable devotion took care of the Atharva Veda while the Itihâsas and the Purânas were defended by my father Romaharshana. All these scholars in their turn distributed the knowledge entrusted to them to their disciples who did the same with their following who also did that with their pupils, and thus the different branches of followers of the Vedas came about. In order to assure that the Veda would be assimilated as much by the less intellectual people, the great sage Vyâsa, the Lord in these matters, took care to edit it for the ignorant ones. For the sake of the women [see 6.9: 6 & 9], the working class and the friends of the twice-born for whom, [in case] of a lesser intelligence, this knowledge is not accessible, the sage was as merciful to write down the story of the Mahâbhârata so that they also could succeed in the performance of their duties. Dear brahmins, thus always being engaged in working for the welfare of all living beings, he in his heart nevertheless at that time by no means could be satisfied. "Strictly adhering to my vows, I sincerely was of proper worship and also respected the spiritual masters in my performance of the sacrifices according to the traditional Vedic instructions. Even for women, the working class and others I, by compiling the Mahâbhârata, have properly explained what according to the disciplic succession should be stated about the path of religion. Despite, so it seems, having been complete in relation to the glory of the Absolute Truth in my discussion of the Supreme Soul as being situated in the body, and even having discussed my own self, I feel something is missing. While Krishna Dvaipâyana Vyâsa thus regretfully thought about his shortcomings, Nârada, as I stated before, reached his cottage. Seeing the great fortune of it, he quickly got up to honor him with the same respect the godly souls offer to Brahmājī, the creator." The copyright of the images differs according to their source. The picture of Nârada on this page is painted by B.K. Mitra.